Cost-effective technologies for removing Hydrogen Sulphide (H2S), Mercury (Hg) and other contaminants from gases and light liquid hydrocarbons. With over 25 years’ experience Schlumberger Purification Solutions is an industry leader in the provision of specialized solutions for the removal of Hydrogen Sulfide (H2S), Mercury (Hg) and other contaminants from gas and liquid streams to operators in the global energy, environmental, and water treatment markets. Nearly every business day, a new Schlumberger purification system is installed somewhere in the world. Many upstream and downstream gas production and storage operations, as well as environmental and water treatment sites, generate unacceptable concentrations of H2S, Hg and other contaminants that need to be removed from the process. Schlumberger has developed a range of safe solutions for the effective removal of such impurities. The company’s technology is the world’s top rated H2S adsorbent used to treat nearly 3 trillion ft3 of gas annually from more than 1,500 applications in more than 30 countries around the world. Our non-hazardous SULFATREAT adsorbents are the industry’s leading adsorbents for treatment of water-saturated gas, and SELECT adsorbents are engineered using enhanced porosity control for improved activity. These SELECT products facilitate greater flexibility in system design and formulations are available for treatment of both dry and water-saturated gas. Mobile units provide flexibility to expedite the removal process for smaller operations or in isolated locations. Both SULFATREAT and SELECT are formulated metal oxide adsorbents used in fixed bed processes for the treatment of dry and water-saturated gas streams and light liquid hydrocarbons. The products are safe in both their initial and ready-for-disposal forms. Disposal and metal recovery routes are well established. SULFATREAT products, based on iron oxide chemistry, require the gas stream to be water saturated for effective H2S removal. SELECT products, based on mixed metal oxides, will work in both dry and water saturated gas applications. SELECT products will also remove Hg. The most suitable purification product is selected dependent upon the process conditions and operational parameters specified by the customer. Customer service is a top priority. A comprehensive technical and engineering support network, as well as experienced field personnel trained to deliver fast, effective and safe onsite services, back all of the products, systems and specialized equipment provided. Schlumbergers purification products are used in fixed bed processes. Gas or vapour moves through the bed in a down-flow design. The contaminant reacts with the adsorbent to form a safe and stable bi-product. Consumption of the product is dependent only on the amount of contaminant that passes through the bed economically matching the need for purification with variations in system flow conditions. 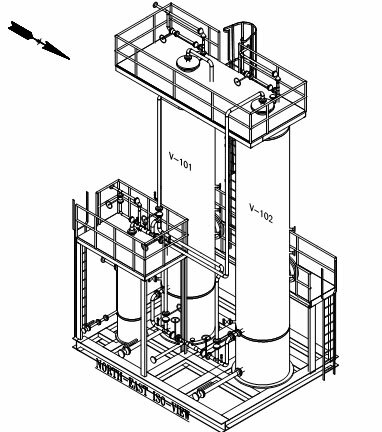 Treatment options include single-vessel systems, lead/lag configurations, and mobile units. Upstream of the reactor is a high efficiency inlet separator with demister pad to remove excess liquids from the gas or vapour stream. This is important; free liquids can cause bed compaction leading to pressure drop issues and ultimately premature breakthrough due to channeling. A lead/lag design provides for maximum flexibility in vessel configuration and is the most efficient use of the media. In this mode gas flows through the lead bed and then through the second bed, known as the lag or guard bed. When the new media has been replaced the vessels are switched. The lag bed becomes the lead bed, and the lead bed is put in the lag position. In this way operators can maximise the capacity of the beds to remove the H2S ensuring optimum use of the adsorbent. This is the most efficient and cost effective operating mode in a continuous H2S removal process. All Schlumberger Purification Solutions products are formulated to stringent quality specifications. Computer modelling provides information on predicted performance parameters, with bed loading determined by flow and contaminant levels. Highly skilled technical sales, quality assurance representatives, and experienced field personnel support the application through every step of the design, build and setup process to ensure a successful treatment solution. Even with over a thousand applications on stream at any one time, Schlumberger consistently meets customer expectations. A full service offering to maintain and restore full production. Firmly established at the forefront of technology, Schlumberger Purification Solutions has a full service offering that integrates pioneering chemical and process solutions, equipment, and software with unrivaled technical expertise. Working with the world’s largest oilfield services provider, customers benefit from a truly unique combination of outstanding technological capabilities and improve their understanding of how to successfully address production challenges in an increasingly competitive marketplace.